Book an escape starting in April or may and receive a 20% discount off the hire charge! Terms and conditions apply. Thurne View is a well presented, three-bedroom detached cottage situated on the Ludham bank and is the ideal place to unwind and enjoy the spectacular views of the River Thurne. South east facing this property has an open plan living/dining room with a large sofa and two arm chairs, Smart TV and an electric fire. From the living room the front door leads you onto a private deck with table & chairs and a small grass area with river frontage. The cottage sleeps up to 6 guests in three bedrooms, the master bedroom offers river frontage views and a double bed, there is a second bedroom with three single beds, a further compact third bedroom with a single bed. There is a family bathroom which includes a bath with shower over. 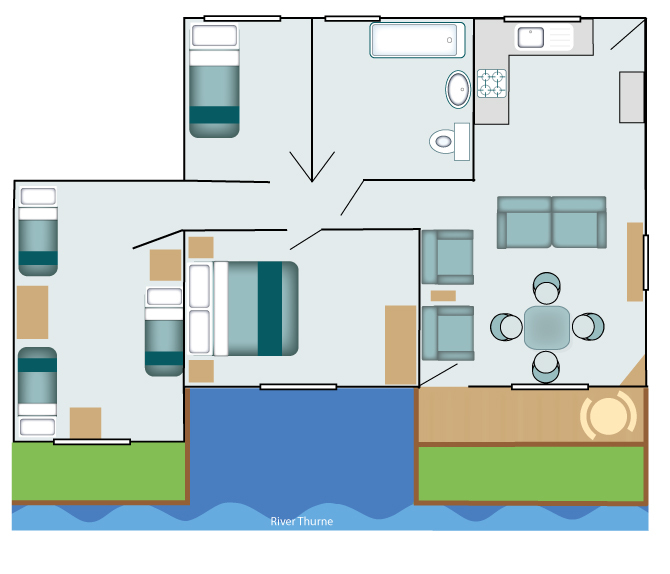 The compact kitchen includes a microwave and is fully equipped with everything you may need for your stay. Thurne View also includes an iron and ironing board and bath towels. Parking for one car is available approximately 644m from the property. Mooring for one boat is available in front of the property. Free Wi-Fi is available within the property and guests are eligible for 25% discount off day boat hire with Herbert Woods.